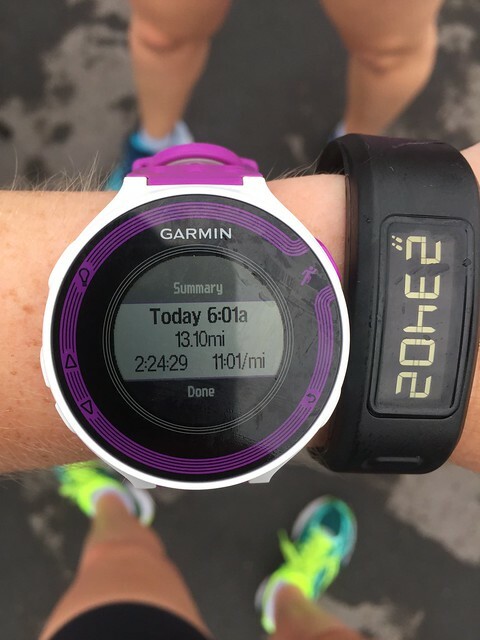 On top of all the craziness of October, I also ran three races. 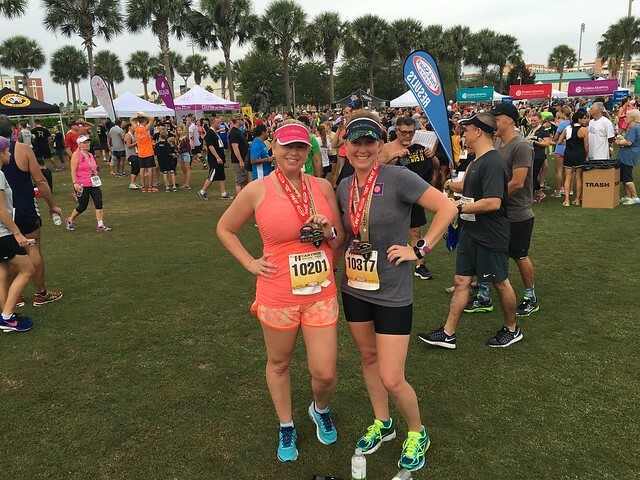 I have already shared about the Key West SoMo 10K, but I also ran the U Can Finish 5 Mile and 2 Mile Distance Dare and the 2nd annual Lake Nona 13.1. 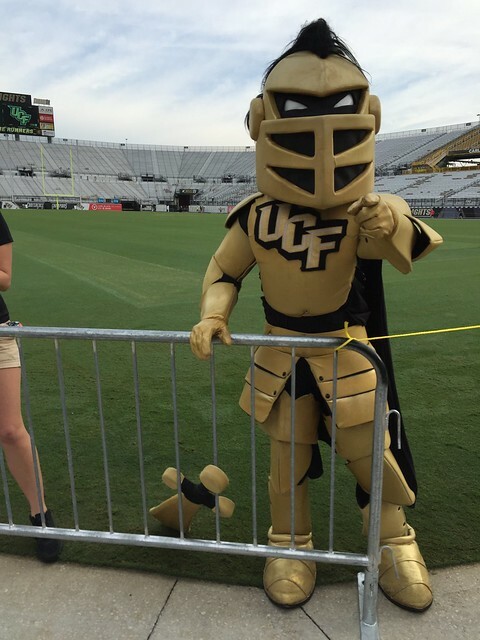 We returned from Key West on Thursday and the U Can Finish race was on Sunday, October 18th at UCF. I ran this race three years ago when I was training for my first half marathon, but missed it the last two years. Two years ago I was about to give birth and last year it landed right on Kenley’s birthday so I opted out. 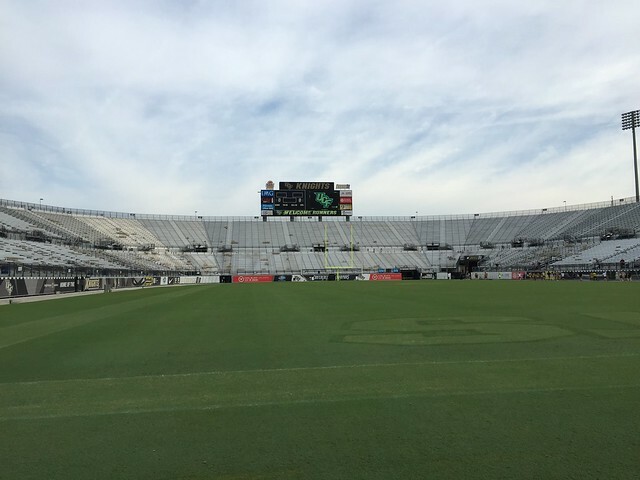 The course was much better this year and we got to run through the football stadium for both the 2 mile and the 5 mile races. We also ran through the baseball field during the 5 mile run. Heather and I came out for the 2 mile run all speedy and ended up running it under 20 minutes (19:14 to be exact with a 9:20 pace). We got a short break after the 2 mile race to go to the potty and came back out ready for the 5 mile race. We decided to go out for the 5 mile run without running intervals to see how we felt. 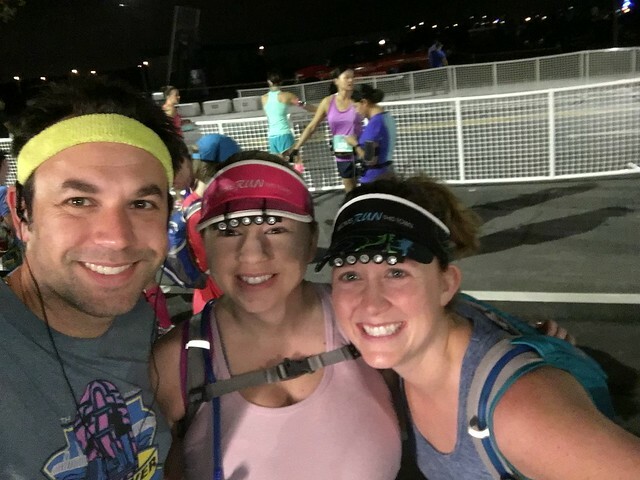 We ended up running it in 52:15 with a 10:10 pace. Overall, it was a great race and it was so fun to run through campus, especially parts that I don’t get to see everyday. Orlando Track Shack does a great job with their races and this one was no exception. 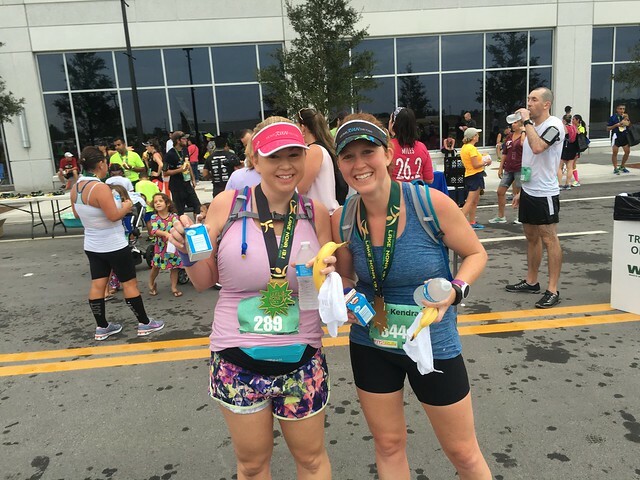 It worked out nicely that we ran 7 miles for this race since our half marathon was the next weekend. 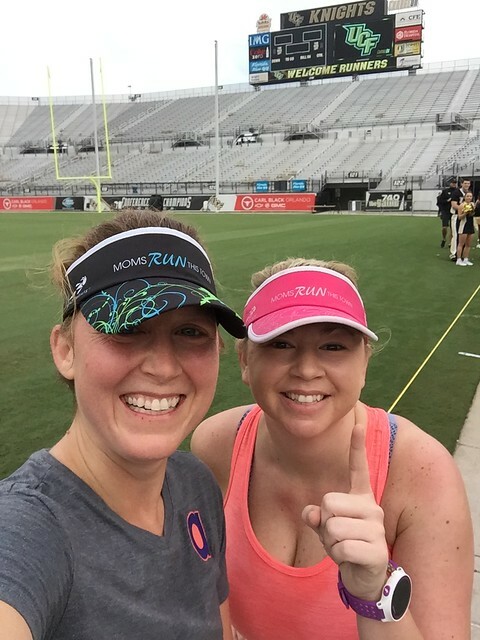 We ran a couple times during the week and were ready to tackle Lake Nona 13.1 the following Sunday. 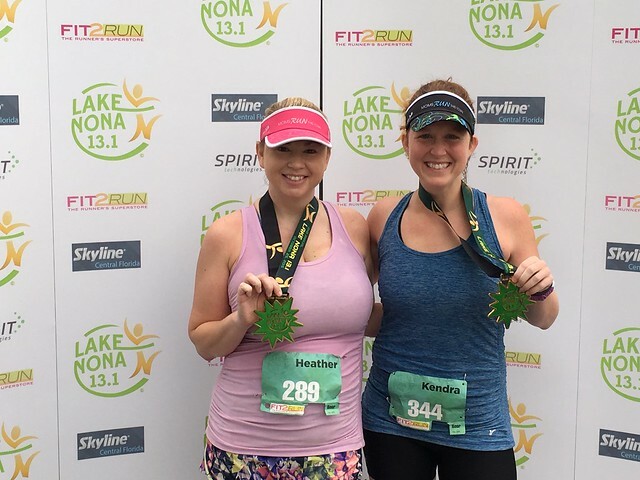 I ran the inaugural Lake Nona 13.1 race last year with Kayla and it was a really great race. I had high hopes for the race this year and had a goal to go out and beat my Tomoka Half Marathon time and get a PR. We were hoping to stay with the 2:15 pacer, but we planned on running intervals, so we knew it probably wasn’t feasible to stay with her the whole time. Ideally, we wanted to see her towards the end of the race. The race started at 6am which made for a very dark race, but it ended up being hot that day, so the earlier start was much better. We started out the race faster than we probably should have but I was feeling good at the start. It didn’t last long though. The course changed slightly from last year, and not for the better. It wasn’t exciting last year, but we turned around at mile 8 so there was a good chunk of the race where we were passing other runners on the other side. This year, there was no turnaround point and we were taken through residential neighborhoods which made for SUCH a boring course. We ended up walking a good chunk of mile 7, going into mile 8. 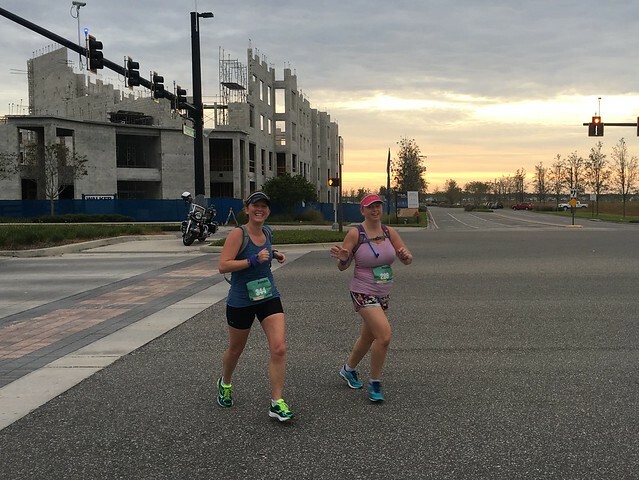 When we were coming out of the residential portion of the neighborhood, we were expecting to go left to head back to the finish line, but instead we took a right…. AWAY from the finish line. What a total buzzkill. At this point though, we started to see some other runners coming back from the turnaround, which made it a little bit more exciting. We passed Heather’s husband and several other moms from the running group. The rest of the race was a lot of complaining and chugging along to the finish. They had ice cold, wet towels for us around mile 10 or so (I think), which was amazing considering it was way too hot for the end of October. Our final time was 2:24:29, which was about five minutes slower than my PR time of 2:20:13 and the time I was hoping to break. I would be lying if I said I wasn’t disappointed, but I knew it wasn’t going to happen very early on in the race. I just wasn’t feeling it and there was very little “race atmosphere”. But, my disappointment was short lived. This wasn’t my worst race and I finished my seventh half marathon, which is something to be proud of. The highlights of the race were all the mamas that were running and the fact that the proceeds of this race go to charity, and I’m all about a good cause. The weather really does play such a huge factor in races for me, so I am hoping my next races are a little cooler! Thanks to the Lake Nona Running Club for putting on this race! Next up, Space Coast!